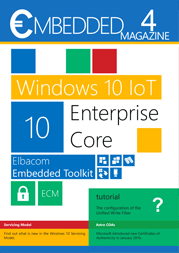 We released our new Elbacom Embedded Magazin 4! Get the latest information about Windows 10 IoT and the 2016 anniversary update. You can also read new information about the Elbacom Embedded Toolkit and the new Embedded Configuration Manager. Read the new Elbacom Embedded Magazin 4 online or order a free print copy.